The Val Gardena is home to the Ladin people, an ethnic group of the South Tyrol with their own language, culture, and traditions. Repressed under Fascism, the language and culture is now embraced and celebrated in this small region. The language is spoken by an estimated 84% of the people in our favorite town of Ortisei and is spoken in the home as a means of keeping the language alive. But as one cannot communicate outside the small Ladin region without other languages, almost everyone speaks German and Italian (education is all in Italian), and many people also speak English fluently, which is helpful with the numbers of non-German and non-Italian tourists. 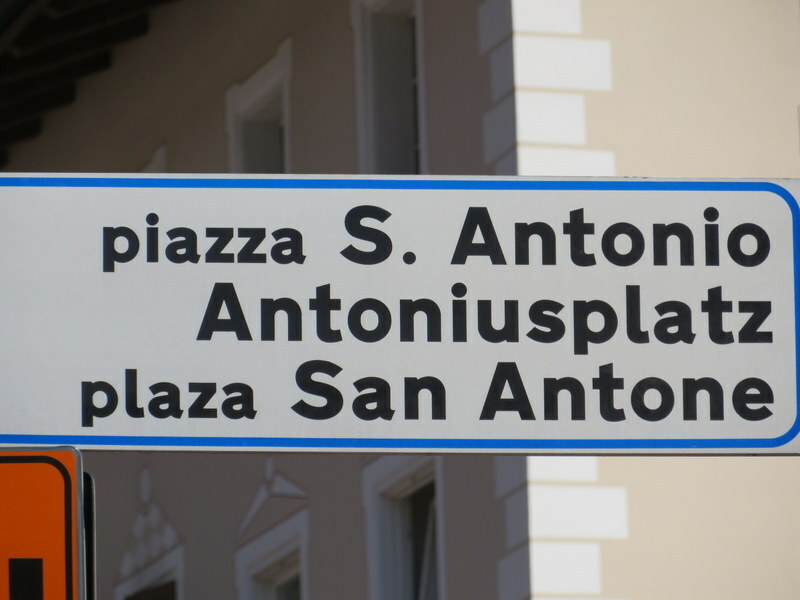 Sign in the piazza: Italian, German and Ladin names for the same piazza in Ortisei. Even the town itself has three distinct names. In Ladin, it means “place of nettles.” Luckily we have not encountered any of the stinging variety. 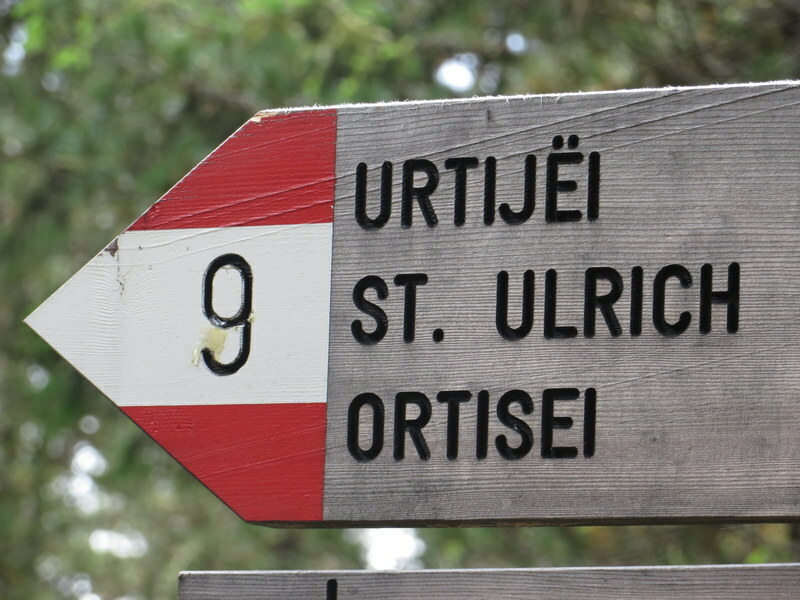 Does trail #9 lead to 3 places? No. All are names for the same cute town. Some place names are vastly different. The other day we were taking a trail we had not intended to hike. We were not really lost, just a bit off course. At a junction where we had to make a decision, we saw a couple descending so I waited to see if they could clarify our choice. First try, in Italian I asked, “Parla Italiano o Inglese.” Blank stare, then the man says, “Deutsch.” “Do you speak English?” I ask. “A little,” he responded. When I asked where they had come from, he answered with “Langkofelhütte.” Luckily I knew that was the German for Rifugio Vicenza and not our destination, that we should take the other path. How can the same place have such wildly different names? A final note, many signs at restaurants, etc., are in Italian, German and English to help the majority of travelers. But translations being what they are, sometimes they are amusing. At this rifugio (one of the nicest we have seen) the hills were steep, but what we really needed was some coffee. Ladin is a Rhaeto-Romance language, much like Swiss. We Americans kick ourselves for not learning many languages, and I think it does make us less culturally aware, but as my Italian friends say, the rest of the world really has to learn English to speak to one another, and we are already blessed to know what is perhaps the most useful language! ‘Crunch of feet of pork and his crazy salad’ and ‘greedy plate of melon.’ Two reasons why we order our food using the French menu. I have no idea how they came up with these translations, but was amused. We didn’t order that first suggestion. I know! I always ask for the Italian menu as it is easier to puzzle out the Italian and ask questions than to figure out what the heck they mean in fractured translation! You and I both know that English is such a difficult language. At least in Italian there is only one pronunciation for each vowel. 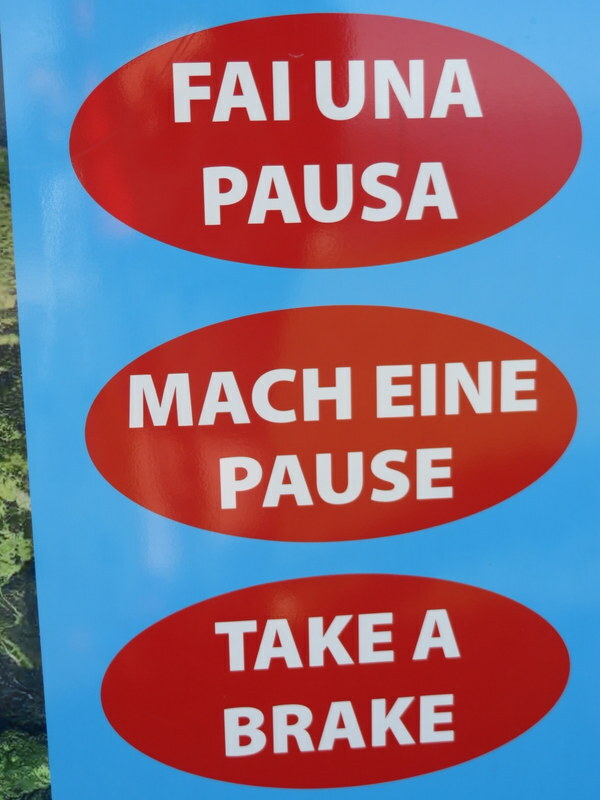 What sensible Italian would think that the two English words “brake” and “break” would be pronounced the same way and mean totally different things. You don’t want to get me started on “read”. Ah, the joys of learning different languages! Well, you really did need to stop so taking a “brake” would work. I have a favorite restaurant…the food is primarily Vietnamese with some Thai selections. It is family run by people who barely speak English and the English translations on the menu are often quite amusing. Glad you are getting your hikes in. It’s cooled off a little here in the Pacific North West. I need to take more notes/pictures of bad translations. There are some terrible ones! I am especially amused when the translation is no more understandable than the original.